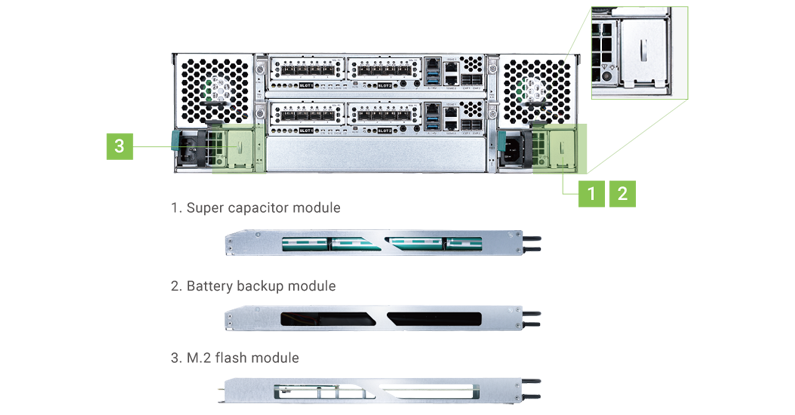 In the event of power loss, the I/O cache data stored in volatile memory will be lost. This can cause data inconsistencies, especially in database applications. The AccuRAID series can provide an optional Cache-to-Flash memory protection function that will safely transfer the memory cache data to a non-volatile flash device for permanent preservation. The optional Cache-to-Flash module comes with an M.2 flash module and either a BBM (Battery Backup Module) or an SCM (Super Capacitor Module). The Super Capacitor Module SCM protect up to 16GB memory per controller and the Battery Backup Module BBM can protect all memory capacity. If your system memory is higher than 16GB, please select BBM solution.